Research note* � In loose notes, I have listed in the 1870 Caddo Parish census "Elizabeth Burnham, age 32". Don't have any supporting info. Could this be our "widow Miller", as she was born circa 1837-38. I have lost the trail on Elizabeth "Lizzie" Miller Burnham Culpepper. Did she go to California with Sampson William Culpepper? James B. Culpepper, 1852 Jackson Parish, 40.3500 acres/28609483. Service Record Card 46724893 and subsequent, National Archives and also a nominal list of killed and wounded in the Official Records, Volume XI Part 1. 1840 Census 1 Jun 1840� Robert was probably a free white male, under 5 years old, in Joseph Mallory Culpepper of Houston Co., GA's household, on the 1840 Census on 1 Jun 1840 at Houston Co., Georgia. Robert M. Culpepper, 1859 Jackson Parish, 159.7100 acres/31255231. Stanislaus Co., CA: John Morris Culpepper, M, 21 Sep 1878, Louisiana, 15 Aug 1959, 80Yrs, Hawthorne, Culpepper. J. Morris Culpepper, Son, M, S, W, 1, LA/GA/GA. R. M. Culpepper and M. S. Prestridge, 11 Mar 1894, Jackson Parish, LA, Book E, p. 230. E-mail written 1998 to Lew Griffin from Mary Jane Price Collins. The correct spelling of the family name is without the "e", as detailed in a privately printed family history of the Hawthorns. (published by John Williamson Hawthorn, Standard Printing Company, Alexandria, LA, 1950). Information on Frederick Hawthorne is the same and his elusive parents Joseph Frederick Hawthorne and ? Bolden remain the same who were from Lunenburg & Brunswick, VA. Joseph Frederick's parents however, were Peter Wilkins Hawthorne, Jr. b. Sept 10, 1749 in Surry Co., VA. d. June 25, 1827 Brunswick Co. VA. wife of Peter, Jr. MARY ANN OLDHAM. (no dates thus far). I also have Caroline Virginia "Mittie" Hawthorne Culpepper's siblings. Gradually putting them together along with their families. 2. SARAH ELIZABETH "BETTY" HAWTHORNE abt. 1837 d. ? m. January 3, 1858 to William Jesse Eldridge in Union County, AR. 3. THOMAS WILKINS "TOM" HAWTHORNE (my great grandfather and Caroline's brother) b. January 12, 1840 in Warren Co. GA. d. August 29, 1912 in Provencal, LA. (Natchitoches Parish) m. MARY ANN RICHEY both Tom and Mary Ann are buried at the Provencal Cemetery in Provencal, LA. (currently expecting something from the National Archives on Joseph) JOSEPH & THOMAS WILKINS HAWTHORNE were both in the Civil War in Company K the 9th Louisiana, and both were captured and sent to Camp Chase Ohio and eventually released. Then THOMAS and JOSEPH joined Company M, the 12th Louisiana the same unit their future brother-in-law ROBERT MALLORY CULPEPPER was in. 4. WEBSTER CLAY HAWTHORNE b. 1845 Warren County, GA. d. ??? 5. LOUIS TAYLOR "ZACK" HAWTHORNE b. October 10, 1848 Warren County, GA. d. March 2, 1922 Provencal, LA. m. FRANCES "FANNY" MCBRIDE both are in Provencal Cemetery, Provencal, LA. 6. RADFORD ALEXANDRIA HAWTHORNE b. August 21, 1851 Union County, AR. d. April 17, 1931 Provencal, LA. m. Amanda "Mandy" Brazzel both are buried in Provencal Cemetery, Provencal, LA. By the way my sources are: Mildred Leslie McBride Stinson and Barbara Johnston; my own personal searching and knowledge Mary Jane Price Collins, John Williamson Hawthorn, Frederick Dews, H L Hawthorne, Warren Hawthorne, John Hawthorn Murphey, John F. Flenniken and Steve Martonak. Reuben J. Culpepper, 2, M, MA. Joseph Culpepper, 6/12, M, MS.
T. H. Culpepper and Joseph Y. Harden married 28 Jun 1866 in Lauderdale Co., MS.
+ Mary A. J. Culpepper, Apr. 25, 1839 - Dec. 7, 1923. + Mary Ann Culpepper, Aug. 21, 1849 - June 21, 1924. Reuben T. Culpepper and Mary A. Harden married 28 Jun 1866 in Lauderdale Co., MS.
+ Horace E. Culpepper, Aug. 26, 1877 - June 1, 1947. Horace Elijah Culpepper, RFD#1, Kewanee, Lauderdale Co., MS, Age 41, Born 26 Aug 1877, White, Farmer. Nearest relative: Mary Ann Culpepper, RFD#1, Kewanee, Lauderdale Co., MS, /s/ Horace Elijah Culpepper. Tall height (6’ 2 ½”), Slender build, Gary eyes, Dark hair, No disabilities. Registered 12 Sep 1918 in Lauderdale Co., MS.
Horace Culpepper, Son, M, sng, Wh, 2, AL/AL/AL. Horrace Culpepper, Son, Wh, M, 1879, 21, S, MS/MS/MS. Horace Culpepper, Son, M, Wh, 30, S, MS/MS/MS, Laborer-Farm Work. Horace E. Culpepper, Son, M, Wh, 42, sng, MS/MS/MS helps on farm. James T. Dawson, compiler, Lauderdale County, Mississippi Marriage Records, Online database at Ancestry.com, 1993. Sarah Culpepper and Berry R. Robertson married 6 Sep 1871 in Lauderdale Co., MS.
William A. Lacy, SSon, M, Sng, Wh, 20, N/A, AL/GA/AL. Martha Culpepper, Daughter, F, Wh, 1 10/12, sng, MS/MS/MS. Willie P. Culpepper, 1, M, W, AL. Malachi Culpepper, Son, M, Sng, Wh, 1M, N/A, MS/GA/NC. R. M. Culpepper and Alma Culpepper married 16 Jan 1890 in Lauderdale Co., MS.
+ Nancy J. Culpepper, Jan. 12, 1843 - Mar. 16, 1892 (Wife of M. J. Culpepper). + Murphy E. Culpepper, Sept. 22, 1892 - Aug. 15, 1905 (Son of R. M. and Alma Culpepper). Clyd Culpepper, Son, Wh, M, Sept 1898, 1, S, MS/AL/MS. Curtis Culpepper, Son, M, Wh, 2, S, MS/MS/MS. Blanks Culpepper, Son, M, Wh, 18, sng, MS/MS/MS. Horace Culpepper, Brother-n-law, M, Wh, 54, sng, MS/MS/MS, Assistant Foreman, City St Department Gang, Vet=N. E-mail written 2002 to Lew Griffin from Emily K. Erwin Allison. James Culpepper married Mary Lacy on 1 Jun 1866 in Sumter Co., Alabama. 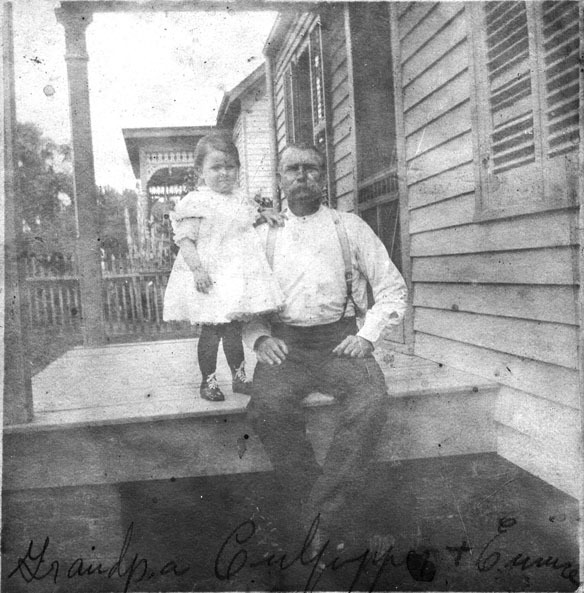 John R. Culpepper, Cuba (Sumter Co.), Alabama, age 43, born 9 Sep 1875, Caucasian, Self-employed as a Saw Miller, Nearest Relative: Ada Culpepper, Wife; Tall Height, Stout Build, Brown Eyes, Brown Hair, No disabilities, Registered 12 Sep 1918 at Livingston, Sumter Co., AL. Mary A. J. Culpepper, Mother, Wh, F, Apr 1859, 61, Wid, ch 5/4, AL/GA/GA. Mary A. Culpepper died Dec 1923 in Sumter Co., Alabama. + Julia Ellis Culpepper, Apr. 3, 1856 - Aug. 29, 1893. A. M. Culpepper married Julia A. McSpeed on 23 Dec 1886 in Sumter Co., Alabama. + Sallie Maude Sanders Culpepper, Aug. 4, 1893 - July 1, 1914. Richard H. Culpepper, Age 27, Kewanee, Lauderdale Co., MS Born 16 Aug 1889 in Kewanee, Lauderdale Co., MS, Farming for self at Kewanee, Lauderdale Co., MS. Dependents: 1 child. Single. White. Prior Military Service: None. Grounds for Exemption from Draft: None. /s/ Richard H. Culpepper, Medium height, Medium build, Gray eyes, Black hair, Not bald, No disabilities. Registered 5 Jun 1917 in Culpepper Pct., Lauderdale Co., MS.
Sam Culpepper, Age 26, Whynot, Lauderdale Co., MS Born 13 Feb 1891 in Kewanee, Lauderdale Co., MS, Farming for self at Whynot, Lauderdale Co., MS. Dependents: Wife & 2 children. Married. White. Prior Military Service: None. Grounds for Exemption from Draft: Wife & 2 children are dependents. /s/ Sam Culpepper, Medium height, Medium build, Gray eyes, Light Brown hair, Not bald, No disabilities. Registered 5 Jun 1917 in Whynot, Lauderdale Co., MS.
Sam Culpepper, Son, Wh, M, Feb 1891, 8, S, MS/MS/MS. Sam Culpepper, Son, M, Wh, 19, S, MS/MS/MS, Laborer-Field Work. Richard H. Culpeper, Son, M, Wh, 30, sng, MS/MS/AL. Jefferson, FHL Film 1254023 National Archives Film T9-0023, Page 620C. E-mail written 1998 - 2001 to Lew Griffin from Jolynne Waits, Pine Bluff, AR. This picture was in a box of pictures from “Gene Allen Laird”, son of Willie Marie Culpepper and H. W. Laird. It was inscribed as “Grandpa Culpepper”. I strongly suspect it is a picture of William Lawrence Culpepper’s Dad, John L. Culpepper. John L. Culpepper with Eunice? Emma? Book VI, p. 70, by Joseph Renfrow, M. G., Methodist Episcopal Church. Joseph Wilson Culpepper, 405 Archer St, Houston, Harris Co., Texas, age 45, born 9 Apr 1873, Caucasian, Self-employed merchant at 1202 Congress Ave., Nearest relative: Mrs. Ella Culpepper, wife, 405 Archer St, Houston, Harris Co., Texas, Tall height, Stout build, Blue eyes, Brown hair, No disabilities. Registered 12 Sep 1918 at Houston, Harris Co., Texas. R. E. Culpepper, Dau, F, S, W, 2, N/A, AR/MS/NC. William Lawrence Culpepper, 410 Tabor St, Houston, Harris Co., Texas, age 37, born 18 Dec 1880, Caucasian, Assistant Manager of Culpepper Furniture Co., 1202 Congress, Houston, Harris Co., TX, Nearest relative: Ollie Culpepper, wife, 410 Tabor St, Houston, Harris Co., TX, Medium height, Stout build, Blue eyes, Blond hair, No disabilities. Registered 12 Sep 1918 at Houston, Harris Co., Texas. Myrtis Culpepper, Wife, F, 35, M, AR CT, MS.
Thomas Little Culpepper, Teague, Freestone Co., Texas, age 33, born 19 Oct 1884, White, R.R. Clerk for the Trinity & Brazos Valley RR in Teague, Freestone Co., Texas, Nearest relative: Myrtis Virginia Culpepper, Teague, Freestone Co., Texas, Medium height, Medium build, Gray eyes, Dark hair, No disabilities. Registered 12 Sep 1918 at Fairfield, Freestone Co., Texas. E-mail written 19 Aug 2011 to Warren Culpepper from William Lenton 'Bill' Rhodes Jr. (s/o #49125), Half Moon Bay, CA, e-mail address. John L. Culpepper, Head, M, 64, M3, md-9 yrs, MS un LA, Salesman-Furniture. John L. Culpepper, Harris Co., Nov 16 1913, 23391. Arkansas Biographical Card File Index, 1819-1950, LDS Film 1926895. Arkansas Gazette, 9 Dec 1906, Section 1, p. 2, col. 2, was a Justice of the Peace in Pine Bluff. J. D. Culpepper, 78, Pioneer Citizen, Dead -- James D. Culpepper, aged 78, died Saturday at the home of his son, C. D. Culpepper, here, following a long period of failing health. Mr. Culpepper, known to many o fhis friends as "Esquire Jim," was born and reared in this county [sic] and spent practically all his life here. He was for many years in the mercantile business at Kedron, retiring several years ago when he came to Rison to live with his son. He was a member of the Methodist church. He is survived by two sons, C. D. and J. A. Culpepper of Rison; one sister, Mrs. James Roebuck of Pine Bluff and several grandchildren. E-mail written 1998-2007 to Culpepper Connections from James Michael 'Jim' Gall (#4364), e-mail address. Cleveland Co. Herald, Cleveland Co. AR..
Benjamin F. Culpeper, 2, M, MS.
Book VI, p. 168, by Charles A. Williams, M. G.
ED 81, sheet 20, Bowman Twp.